Later this month, our metal casting users will be WYN-ing with the release of FLOW-3D CAST v4.2. This new release features a streamlined user interface designed with a focus on WYSIWYN – What You See Is What You Need. The FLOW-3D CAST v4.2 interface will make simulation setup more efficient and error free by providing a consistent layout and a flat design that shows users the most important simulation information on the top level. This blog post discusses some of the new interface designs and the workflow efficiency users will experience. Casting simulations are notoriously complex due to the wide range of physical processes typically present in real casting processes. For example, most casting processes include heat transfer, solidification and melting, air entrainment, cavitation, and surface defect generation. There may be numerous geometry components such as dies/molds, cores, cooling channels, shot machines, and pouring ladles. Additionally, the user must create computational meshes, define metal filling locations, instrument the simulation for analysis, and define output data. With all this information on the screen, simulation setup can be challenging. FLOW-3D CAST v4.2 uses the WYSIWYN concept to place the most important information on the top level so that users can quickly see what options are set, show/hide information easily, and quickly get an overview of their simulation. 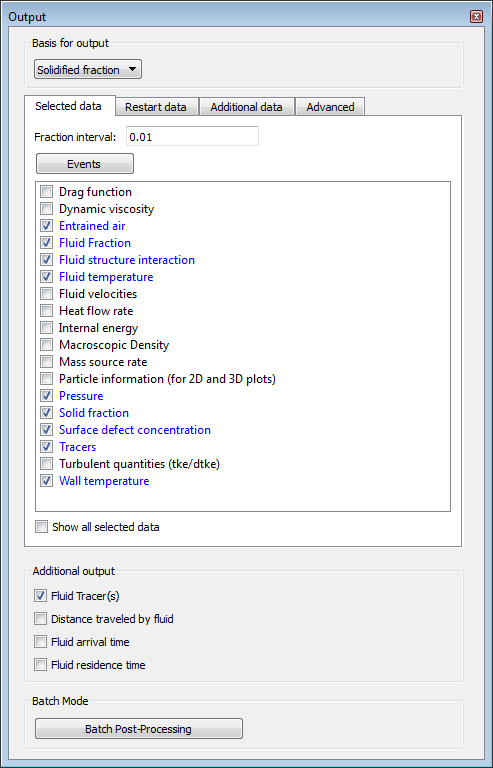 Simulation setup information is displayed in panels in the FLOW-3D CAST v4.2 interface rather than deep trees that are typically used in simulation software. 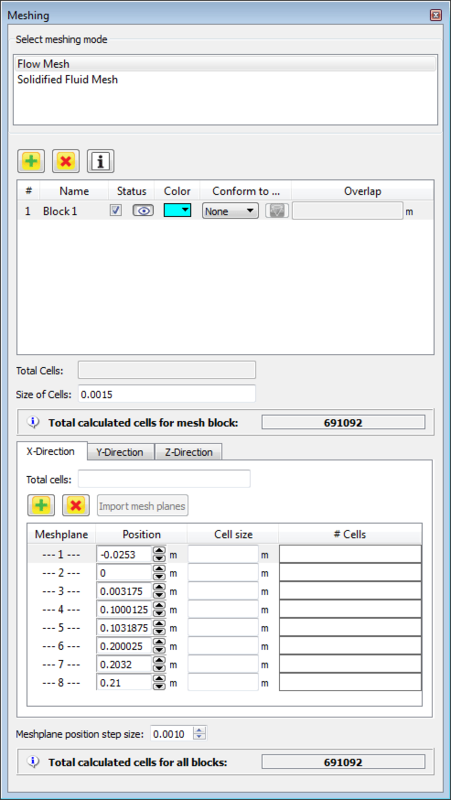 An example is the Meshing panel shown below. Key meshing information is immediately visible on the panel, including all meshing modes (Flow, FSI, TSE), mesh details, visibility/display selections, and controls. In a single view, users can quickly see all pertinent meshing information, as well as make adjustments. 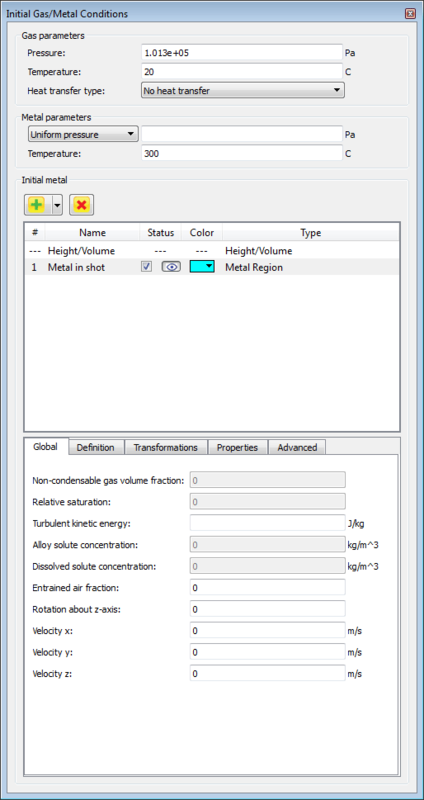 The Initial Gas/Metal Conditions panel shows all the information necessary to define the initial temperatures and pressures for the gas and metal in the simulation. This panel also provides all 3 methods available for initializing metal in one location. Specifications that apply to all initial metal definitions are shown on the Global tab, whereas specific information such as region definitions are easily accessible on tabbed sub-panels. The final example of the new WYSIWYN panel design in FLOW-3D CAST v4.2 is the Output panel shown below. The Output panel follows the WYSIWYN principle by displaying the most commonly-specified information – selected data, fluid tracers, and fluid residence time in the casting, and batch post-processing setup – on the top level. Information specified less frequently, such as restart data, strain rate, and history data, are placed on sub-tabs. This keeps the view of the simulation clean and uncluttered. The three panels discussed here are just a few of the many new interface enhancements that will be available in FLOW-3D CAST v4.2. Casting users will be delighted with the new interface that puts even more simulation capability at their fingertips. The next blog will feature another important development in FLOW-3D CAST v4.2, process oriented setup.